(By Irfan Mastan & Zahid Samoon) The mind, which wanders around in the chaos of urban life, is suddenly at “Peace” when it engages with “Nature”. 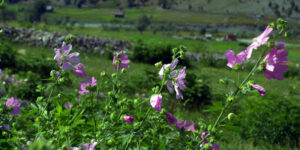 We all seek inner peace and “Gurez” is one such place, which offers us with just so much more than that. Gurez has been a well-kept secret. An enthralling place shrouded for a very long time, the existence of this kind of place is something that exists in dreams for many of us, with references for it only in books. A place once frequently visited by Indira Gandhi, former Prime Minister of India. It has been awestruck by every one of the favourite destinations of foreign tourists during pre partition days of British India. Even Franklin Roosevelt former President of USA was fond of this place. 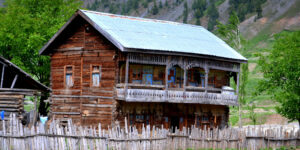 Gurez, as a tourist destination has a lot to offer, it’s virtually a virgin paradise of ethereal beauty. One can laze around, work in fields, sit by the river, climb the mountains, kayak, trek, go fishing, rafting and continue to get passing moment. 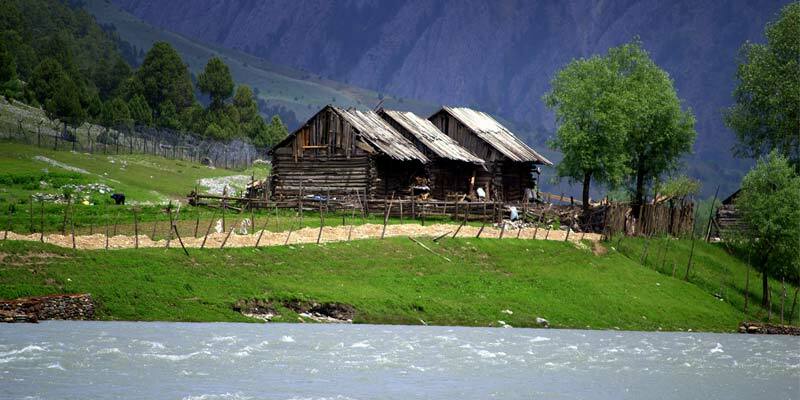 Gurez offers sumptuous delight of trout, which is a delicacy. For the city dwellers Gurez is a picturesque setting amongst low-lying clouds, surrounded by mountains, gurgling water and lush green all around which provides us with much-needed relief from exasperation we suffer from. Nowhere in India are the mountains so close and within reach. Sipping that morning cuppa watching the low-lying clouds and feeling the gentle cold breeze with soothing sounds of the river is a divine experience. From an era of buzzing economic activity during the days of silk route to present day Gurez which doesn’t have electricity for majority hours of the day. And the only consoling hrs of electricity are from 1800 hrs to 2300 hrs, that’s when the locals connect and socialize with the outside world. The people have lived in seclusion for a very brief period long forgotten by the majority world. The people though neglected & forgotten are still self-sustained, determined, helpful and happy. They are always more than accommodating and hospitable to the modern day tourists. 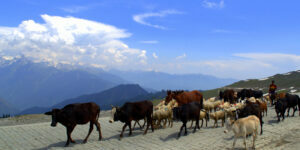 Gurez is a path less trodden and once done, it offers a seldom experience to all travellers. It has a rich past since the times of Herodotus and in the recent past it has been one of the busiest silk routes connecting Kashmir with central Asia. 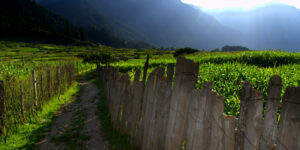 Gurez which although prides itself with unparalleled bestowed beauty by the God’s, still remains a budding destination. The wild life comprises of the Himalayan Brown Bear / Hangul / Snow leopard / Himalayan Red Fox / Musk Deer and Ibex (the source of pashmina wool). come across the local superhero, who was also a legend by the name of Mr. Ali Pehalwan of sandyal village. It is said that during 1971 war this man worked as Porter and single handedly pushed tanks to higher reaches and also uplifted heavy oil barrels, which normally was the work of at least 8 to 10 labourers. For this reason he was famous for his strength and power. There was a general perception that he used to carry more than 100 Kgs of load on his back to far off places, which others couldn’t do. 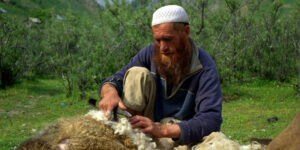 The Gurez’s staple diet consists of locally grown organic vegetables – Cabbage/peas / Potatoes (Famous) / Turnip / Red Kidney Beans (Famous) / Carrot / Raddish / Spinach / Corn / Proso Millet/ Barley / Cumin (known as Black Gold, which is priced very high) and super foods like Quinoa & Buckwheat which has been used since ancient times, the commercialization of this ancient super foods has a very lucrative market. Here some of the crops like millet, buckwheat, Barley and peas are raised by help of irrigation. Original and wild mushrooms are found all over Gurez and Tulial. The place is also rich in medicinal herbs (approx. 50 types) and wild flowers & fruits (blueberry / cranberry / strawberry) along with local produce of walnuts and apples. Some of herbs are Doopa, Bankakri, Patris, Jogi Badshah, gow zaban, kutthe, Sheetlari, Koh-momia, Zeera and many more. The local cuisine comprises of Mulkibai (Made from Locally Grown Organic Barley), Kashi (Made from Corn), Special Variety of breads include – Gizeri (Made from Buckwheat), Durum Tiki (Made from Sprouted Barley). One of the most exciting activities would be trout angling (With Permission), apart one can undertake short and long treks to Paatalwan and twin lakes of Kisarsar & Vishensar. The food is scarce in the winter months and needs adequate storage in good quantity to make it through the harsh winters.The winter temperatures are a freezing -25 to -30 degrees with virtually no access to the outside world, and the only means of emergency access would be the availability of chopper services by the armed forces. The access to Gurez these days is by chopper and by road (Shared / Private / Bikes).Travellers may choose to their liking and comfort to reach this beautiful hamlet. One can take services of chopper from Srinagar Airport and reach Gurez in about 20- 30 minutes. But the real way to enjoy would be to travel in a shared transport right from Srinagar to Gurez. Srinagar (Batmaloo to Bandipur for the first leg & Bandipur to Gurez for the second final leg). The local dialect and warmth of the people, will give oneself an insight to their world. In earlier days, one had to drop down the Jehlum River by boat and cross the Wular Lake to Bandipora. But these days one can cover this distance through Road in a Hour. While leaving Bandipora one gets a glimpse of Madhumati River near Sonarwani. This river is very famous among the Kashmiri Pandits and has religious value for them. From Sonarwani the path Zigzags up a spur for a rise of several thousands of feet and then comes to a part where the slope is more gradual; here the ground is varied, being broken into sweet little flowery dells surrounded by fir-trees. Tragbal: The first pit stop is Tragbal, 4000 feet above the level of the kashmir valley, an oval opening in the dark fir-forests. From some spots nearby we command view of the Vale we have left, and of the opposing Pir Panjal Range, whose peaks, separated from their base by a great depth of mist-hidden ground, catching the sun’s light, look like mountains of another world. Enroute Gurez we come across a holy shrine of a famous peer-fakeer from Pakistan. As a mark of respect to this revered saint, Indian Army has constructed a tomb. The locals travelling by foot during winters take shelter here to save themselves from winter snowstorms. This is a very revered saint immensely popular amongst the locals and the armed forces. Razdhaan Pass (11700 feet): From Tragbal a rise of about 2000 to 3000 feet more, up the same spur, brings us to the Ridge. From here we can capture the scenic Harmukh Mountain (it is a sacred mountain for Hindus). A short journey past pine-covered hills brings us to Gurez, the chief valley, of which the hamlets are little clusters of log huts. This place (Gurez), which once gave its name to the whole district of Gurais, is some four to five miles in length, the valley is rather wider than at other parts, being a mile across; it is bounded on the south by wooded mountaines, and on the north by a great steep cliffy limestone mass, which rises to 7000 or 8000 feet from the river. The height of Gurez is 7800 feet above the sea level. This elevation, combined with a great amount of cloud and rain in summer and snow in winter, makes the climate inclement. The best produce of Gurez are the ponies, which are the best to their size for loads. In Gurez there is a mixture of Dards and Kashmiris, but the former predominate. Gurais which has been spelled as Gurez in recent times is also called Gorai in the local Shina language, part of the ancient Indo Aryan languages. Having close resemblance with Sanskrit this language was called the mother of Kashmiri language by George garrison in his book “linguistic survey of India”. Gurais stretches from “Sharda Peeth” in west to “Minimarg” in east and “Drass” on another side. Kunzalwan: The Kishenganga river rises 40 miles to the east ward of this spot towards the end of Tilail, among the mountains close to Drass. The origin of Kishenganga river is at Koubal (also called “kabuli gali”). There is a tract begining a few miles below Kunzalwan, where the valley is so narrow and hill-sides so steep that, although the climate is favourable, no cultivation exists and there are no inhabitants in this area. At Kanzalwan we can see the diversion tunnel being constructed towards Bandipora, which is a part of 330-MW Kishenganga hydro project. Ismarg: It’s one of the beautiful places in Gurez. The horticulture department has potato, apples and various flower growing nurseries. There is also a Sheep department as well. It is connected with Baghtor, which leads to Tarabal. It is the last village from this side of Gurez Valley and is connected with Neelum valley(part of the Gurais) on other side of Border. Majority of people of these three villages speak Kashmiri. There is a legend about Dev-Ahram, who travelled from Kashmir to Dardistan in search of his beloved Badwel-Jamal & rested there near a huge stone. If there is heaven on earth, it’s here, it’s here, it’s here! The etymology of these beautiful words is evident in the beauty spread across the length and breadth of Kashmir. Pushkar Naag: It’s in Badwan village. This was a seat of learning where some Hindu Learned man had constructed a “Paathshaala” and a rest house for the travelers of Central Asia. Dari Khun: In Rajtarangni, Kalhan has named this place as “Dugidagat”, where many battles were fought between Kashmiris and Dards. Ruins of many battles are there at “Vigigali” on the peak of mountain. This was also a route to Kashmir Valley. 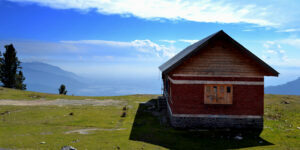 Khandyal: On the top of the mountain there is a big and magnificent lake called “Kisar Sar”. At Khandyal we can see the remains of the Aasthan-Nallah project, which was left midway because of the proposed Dam project in Gurez Valley. If completed, this project would have given 24-hour power supply to whole Gurez Valley. Towards the entrance of the Khandyal village there is a Shrine of “Babha Darvesh”, a Syed who along with other seven missionaries spread the Islam in this Area. Ziyarat Babha Razaaq: It’s a shrine of another Syed (brother of Bhaba Razaaq) in the lap of mountain who helped in spread of Islam in this area. Many archeological remains like old utensils, coins, pots etc. have been found here by local people. I also collected some broken parts of a pot here. Dawar: This is the main village and is centrally located. All the offices including the only hospital are located here we can see the Anzbhari nallah here. Mastan: A high mound of land is present here, which acted as a stage in earlier times, from where the rajas or the people of repute addressed the general masses. masses The first ever residents in Gurez were Mirs. Markoot: There is a bridge between Achoora and Markoot. And on both sides of the bridge there are remains of buildings. These ruined building were courts of old Rajas. The Kishenganga River bisected it naturally afterwards. Achoora: We find the great Habba Khatoon Mountain with all its grandeur and the famous Habba Khatoon Spring here. The speciality of this spring is that the water flows throughout the year even in sub-zero temperatures. The elegance of Habba Khatoon in a full moon night is something to lookout for. Chorwan (last village): This leads to another part of Gurais, which is under direct control of Pakistan. It is a way towards Burzil and Kamri passes. Burzil Pass gives way to two routes one towards Gilgit and another towards Baltistan-Skardu. During Kargil war infiltrators crossed through this pass and went towards Tiger Hill and Mushkow Valley. Chak Nallah: Named after Chak Dynasty it’s a tributary to Kishenganga. Here in the way, Khurgi Nallah also adds some volume to Chak nallah, also some old sculptures of Hindu as well as Buddhist deities were recovered by Indian Army near Barnoi (the first village of Tilail). Kashpaat: This area also leads to the Kilshey (part of Pakistan). Sheikhpora: This is yet again a beautiful setting amongst majestic mountains and river. One can opt for an overnight stay in the government tourist hut here, and next day proceed onwards to Kabul Galli with requisite permission from authorities. Badgam: It is a central place of Tulail. Here we have Niyabat, and other offices. Badaub: Here two ways arise from Badaub one lead to Kashmir through Raman Nallah-Gangbal lake-naranaag-kangan Srinagar. Another way leads to Gilgit through Bagrote Nallah. Abdullae: it is the last village of Gurez. And from here the road leads to Drass via Kabuli Gali (Kaubal). Drass is also a part of Dardistan. Here also the regional language is Shina. 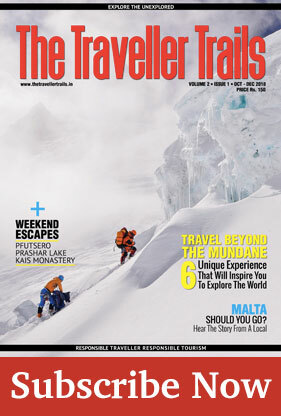 The journey to Gurez would leave you spellbound. 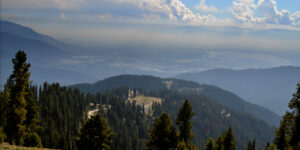 The exciting part of Gurez is the very close proximity of LOC no matter where you go. However certain areas are off-limits and care should be taken not to to indulge in photography / GPS tag around zensitive locations. The three primary checkpoints are at Kanzalwan / Neeru / Ismarg and tourists need to co-operate with the armed forces for documentation formalities. ACCOMODATION: As this place has not yet found its place in the regular travel map of most travellers, accommodations in Gurez has very limited options. (Former INR 500 & Latter INR 750 onwards) offers good clean basic accommodation at reasonable prices. Apart there is a beautiful 3-room cottage (Gurez Retreat / Pathan’s Cottage) at wanpora with services of a caretaker; there is also a guesthouse nearby belonging to a local MLA. BEST TIME TO VIST: May 4th Week to Aug (Jun – Jul being the best months). 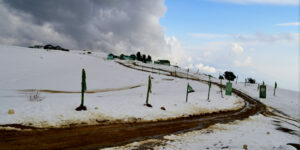 The valley remains inaccessible by road during winters. FOOD: Food options are very limited with just two restaurants or rather small eateries serving basic food (Close to the TRC Huts).